Good afternoon! I intentionally didn’t check in early with the sunrise this morning. While catching up on some extra z’s (why my body is still adjusting to E.S.T. is beyond me), I wanted to give you a chance to catch up on last weekend’s happenings at the IDEA World Fitness BlogFest! I said it before and I’ll say it again: IDEA is where it’s at, ya’ll. I was interested in attending the conference last year, but now that I am in the process of getting my CPT and continuing on with a career in group exercise and small group training, I convinced myself that I had to be there this year. And I’m so, so glad I made it happen. The first two days of the conference were focused on two of my favorite things: fitness and blogging. Thanks to Sweat Pink, close to one hundred and fifty fitness bloggers gathered to discuss the business with tips and tricks we have gathered along the way. I felt in my element the whole time! As great and beneficial as BlogFest was for me to attend, I was really excited to join the rest of the community at the IDEA World Fitness Convention in Anaheim on Saturday and Sunday! The IDEA World Fitness Convention provides around 400 well-respected fitness experts to lead sessions holding a total of over 12,000 fitness professionals (or fitness professionals in training, like me) throughout four full days of sessions and certification training opportunities. Before I arrived, I signed up for a handful of sessions – one for each time slot provided – but knew I would probably change my schedule around once I got there. As someone who has never been in the environment before, it was pretty overwhelming for me to decide on my own. Luckily, I had a pack of friends that have been through it before and helped lead the way. We didn’t all stick to the same classes, but because a lot of us have similar interests in the types of workouts we like to enjoy and possibly teach, I had some familiar faces with me throughout the majority of my sessions. Saturday started with a 7:30 a.m. Total Barre class that lasted two hours. I wasn’t sure how I felt about the time, but it was clear once we started that this session was meant to incorporate new exercises and Merrithew equipment into the classes of those who already teach or have an interest in teaching barre. I thought these ankle cuffs were interesting. They were great for that exercise, but served the same purpose as a multi-use resistance band (you can double for intensity) I often used in my classes in Orlando. I liked the class, but could tell that the style of exercises and music would most likely appeal to an older audience. I kept thinking that my mother would love this class! We did, however, have a young male in our class who had the highest kicks (<- ballerino, possibly? ), so you really just never know. All in all, it felt great to get back to the barre and start the morning off learning some new exercises. Directly after class, we walked over to our next session, Schwinn Cycling: Pimp My Playlist with Jeffrey Scott. He started the session off with his tips on how to find and get the best music playlists his students love in his classes. As someone who is obsessed with music, I knew a lot of his tips but picked up a ton of new and helpful information! • Schwinn Indoor Cycling Class Tamer app for your iPhone – amazing! Even if I don’t ever teach spinning, I think it would be great to use during other types of workouts with the sound effects, timers, and ability to control your music and volume through it all! • Radio streaming and talent shows on television like So You Think You Can Dance, The Voice, American Idol, The X-Factor, etc. After he wrapped up his tips for putting memorable playlists together, he turned on one of his favorites and put us to work with a Schwinn Cycling class. It was fabulous and now I’m dying to find one near me. The Schwinn bikes were so great and easy to use! Jeffrey is one of the best instructors I have ever had the pleasure of taking from, which makes sense, considering he is a Master Trainer for both Schwinn Fitness and Reebok. But really, he has to be one of the best out there and had me smiling and loving the workout the entire class! Julie also did a fantastic job recapping this session with Jeffrey’s tips! I already said this about Tara Stiles and yoga, and it happened again during this session with indoor cycling. Usually at some point during a spin class, my mind wanders off for a bit and wonders how much time is left. This time around I was ready for more and legitimately enjoyed myself, which isn’t an easy thing to do when you are on those uncomfortable bike seats bouncing about. We all couldn’t stop raving about it. Thanks for a great session, Jeffrey! After a quick change of shirts (we were all embarrassingly sweaty), we walked over to the EXPO to make our final rounds. Obviously, this included another trip to the massage chairs. We made appointments for five minute massages, but before it was our turn to go, found this DS MAREF circulation and massage machine. I had never tried something like this! They looked like space pants and felt like someone was pressing the hardest, most intense foam roller all up and down my legs and feet. I didn’t realize how much it did until I stood up feeling loose like I just got a massage on my lower half. It was great! We spent the next hour or so walking around, grabbing snacks, chatting with vendors, and may have even played a few rounds of Dance Dance Revolution. Somebody had to. We wrapped up our time at the EXPO passing the Reebok booth and I fell even harder for certain pieces in the Reebok Yoga line. Thank you, Tara Stiles, for making me want all of the sports bras per your recommendation and stylish, comfortable designs. There’s just a bit more of the IDEA World Fitness Convention to cover along with what I learned from going to share. Instead of rambling on further, I am going to address it in a separate post. Do have any questions? Feel free to leave them below in the comments section. I would love to answer them in my tips with what I plan on doing the same and differently at the conference next year. Stay tuned for the final recap coming up! Love all the IDEA and Blogfest stuff! So fun to read about and very informative 🙂 Thanks for sharing! Thank you so much for following along in the journey! Love reading these recaps! I’m curious — Was there something in particular about the spin class you attended that kept you engaged the entire time other than the music? Or was it mostly the music? I ask because I may consider teaching spin (or RPM to be more specific) in the future, so I’m wanting to know what made your experience so great. And then in general — What were some of the things you took away/learned from the conference? Great questions! I’ll be sure to cover what I took away from the conference in the next post. As for the spin class, it was a combo of his music, the Schwinn bikes (amazing and so easy to use), and HIM! He was hilarious and so motivating. He had the entire class singing along to the songs and incorporated fun sounds and features from the Schwinn indoor cycling app! Love the recaps Heather! I also love pink top you are wearing in the group photo. Where is it from? If you want suggestions for more posts I think it would be great to hear your takeaways from the blogging info sessions. Oh I would have loved this; it sounds like a blast! Oh who was your instructor for Total Barre? I’ve done the Total Barre instructor foundation course as well as a number of other Merrithew/Stott Pilates certifications. My first instinct was that the Total Barre class was not as pop-like as some other ‘brands’ of barre, but I came to love the fact that they focused so much on technique and proper modifications. The good instructors I’ve had used that as a foundation for a safe class, then incorporated fun music and elements to make it appeal to a tougher crowd. I’m excited to hear your thoughts! Ha, I’m totally guilty of that. If I Shazam it, I’m usually going to buy it. 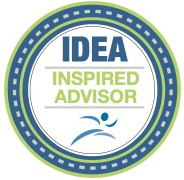 IDEA is great for anyone looking to get certified and even offers continued certifications with CEUs and CECs with their classes! If I can, I plan to attend from here on out! Omg I love DDR! How fun that they had it there!